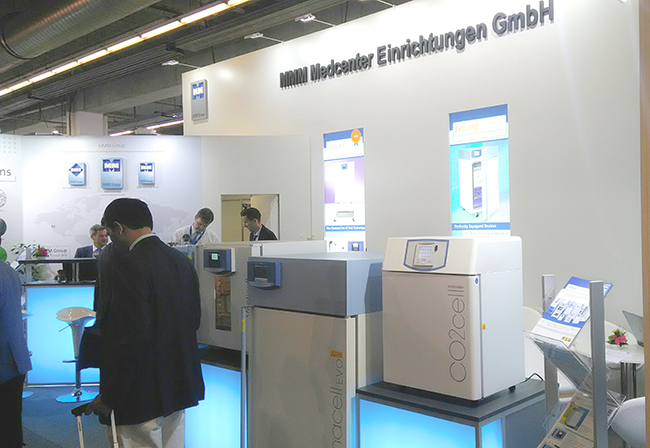 The most important pharmaceutical and laboratory specialised trade fair ACHEMA is held in Frankfurt, Germany, every three years. This is the largest exhibition in the branch, with simultaneously held congress, being one of the most important in the world. The number of exhibitors remains the same, but the number of visitors unfortunately decreases. The decreasing numbers of visitors in specialised events are a global trend. But our exposition does not aim at the quantity of visitors, as we are interested in qualified and potential clients. Again, we have found a lot of them in the course of the 5 days. We had really very interesting meetings with current business partners as well as with new potential clients, while all of them positively assessed the quality of new ECO and EVO lines. In the course of recent 2,5 years, the highly motivated development team of the BMT company completed a great job. They developed and constructed new innovative products with many advantages. Modern design, innovative and intuitive control, independent diagnostic system and extensive setting possibilities, wide range of documentation functions, like the SD card, USB, WIFI, Ethernet, BMS relay, serial interface and others. We optimistically view the future and we actively work on our global expansion and growth of sales numbers.